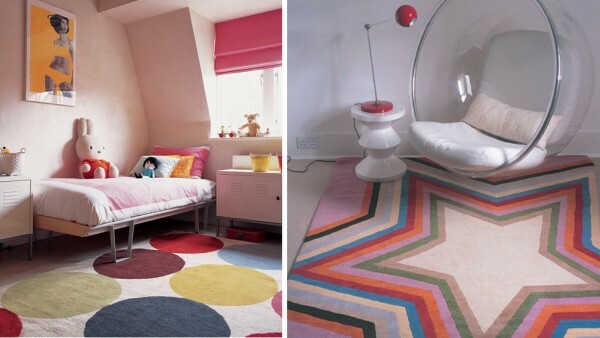 Making a soft space on the floor for playful youngsters, providing texture and a splash of colour, rugs are the non-permanent essentials of decor. Patterns on a rug can add that perfect bit of drama and texture to an otherwise understated room. Go ahead and be adventurous with huge spots and colourful stars like those above from The Rug Company. This elite name in rugs first came to my attention via the blog Seeing. Hearing. Speaking. 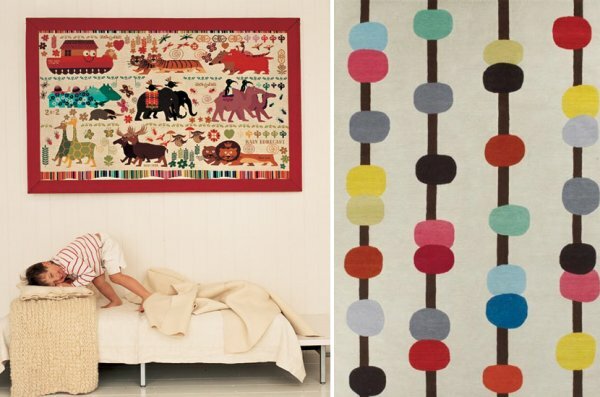 but it seems the designs fly out so quickly that the animal rugs I fell in love with are no longer listed! If you can’t find a design you love at The Rug Company then there may be no rug on the planet for you. The lush ultra-professional pictures of interiors in faraway places are absolutely entrancing, with the rugs enhancing every single one of the rooms. With designers such as Vivienne Westwood, Diane Von Furstenburg and Paul Smith, just to name a small selection, you will find the royalty of rugs at the The Rug Company. Gorgeous wall hangings and cushions are also available. Email for the price list – international delivery from the UK is available.